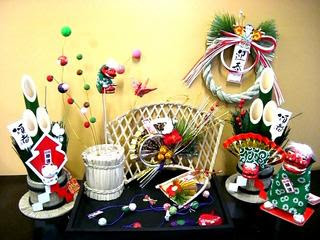 The New Year in Haiku lasts from January 1 to 15. Shoogatsu used to co-incide with the first month of spring in the old lunar calendar, from the new moon to the full moon on the 15. Therefore it was also the first month of spring in the old system. Many kigo of this "early spring / new year / January as late winter" time bracket need to be checked carefully. When the new saijiki were compiled according to the solar calendar, a fifth season, the NEW YEAR was introduced to avoid these complications. Many of the preparations for the New Year, done in December, are also problematic with respect to the season. wakaki toshi 若き年（わかきとし） "young year"
toshi kawaru 年変る（としかわる） "the year changes"
bajitsu 馬日（ばじつ） "day of the horse"
. . . . . SAIJIKI and KIYOSE . . . . .
World Kigo Database - . . . . . ABC-INDEX . . . . .
On the 20th day of the New Year (mugimeshi shoogatsu 麦飯正月 eating barley) Yamanokami goes to the forest to cound the trees. If a person goes to the forest on this day, he will be counted as a tree and later experience disasters. So this is a holiday for the forest workers. The young folks hang a Shimenawa sacred rope over the road to the village and the elders now take a rest from the usual farm work.